In 1988 the Office of Technology Assessment estimated that 30,000 children were born via donor insemination during the year 1986/87 in the US. More than a quarter of a century - and no further research - later, '30,000 annual births' is still trotted out in academia, lectures and the media. Sometimes the number is doubled, probably to allow for the passage of time, and occasionally a range of 30,000 - 60,000 is deployed. The media, academics, and other "experts" should not be using such patently erroneous figures. Rather, they should be noting that there is no reliable method of assessing how many children are conceived via donor insemination each year. They should be pointing out that the USA has no accurate tracking or record keeping from which it is possible to make an educated assessment. And please, the media (US and international) needs to understand that most people that use donor sperm do not utilize IVF! Instead of complacently relying on outdated best guesstimate figures from more than a generation ago, they should be demanding reliable, recent figures. They should be voicing outrage that neither the fertility industry nor any other entity is required to collect data or report statistics on the numbers of human beings conceived using donor sperm. Even though it is sometimes reported that numbers of egg donor children born are tracked, more than 40% of egg donor parents surveyed by the DSR told us that they were never asked to report the birth of their child, and many had never done so, leading to incomplete egg donor birth tracking as well. This is in stark contrast with livestock insemination, which is much more tightly regulated and surveyed. 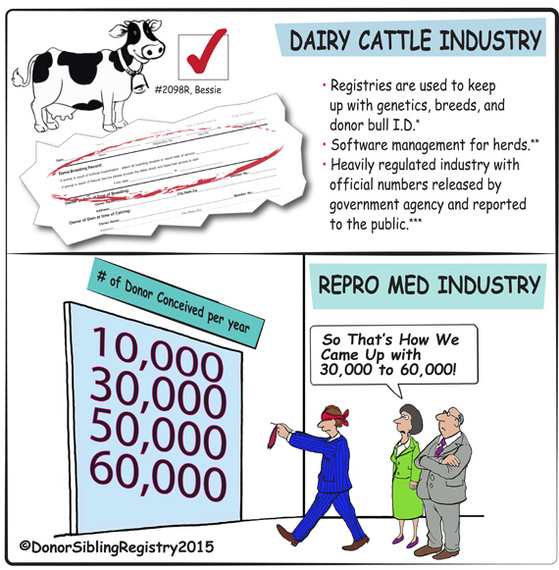 The donor insemination landscape has changed significantly from the 1988 report. In 1986 almost all recipients were heterosexual married couples; nowadays, straight married recipients make up a small minority. Parents on the Donor Sibling Registry are 50% single women, 33% in LGBT families and now less than 20% are straight couples facing infertility. Whereas in 1986 the majority of donors were recruited directly by fertility doctors, (or fertility doctors themselves), most donors are now sperm bank recruits. The number of sperm banks has rapidly increased since 1988, as has the number of donors. But the greatest change of all is the opportunity for kinship acquaintance. In 1988 it was essentially fantasy for donors or offspring to think they would get to know one another. Now, in the generation following the advent of the Donor Sibling Registry (DSR), and with DNA testing, such knowledge is almost an expectation. Only one thing remains the same: the general lack of comprehensive medical and genetic testing of donors, or any mandatory requirement to do so beyond testing for STD's and a small handful of other diseases like Tay Sachs. The result is that some banks, test some donors, for some diseases. Over the last fifteen years, the DSR has collated the most comprehensive records that currently exist in the USA. With 47,600 worldwide members, including records of over 2,400 donors, it also includes details of hundreds of worldwide sperm distribution facilities. However, these records are very incomplete, as all have been obtained via voluntary registration. For several years, the DSR has been applying pressure to sperm banks for them to maintain their own accurate record keeping system, but progress in that direction is slow. And even if individual sperm banks did create proper records, in order for them to be accurate and reliable they would need to be collated and integrated with the records of every agency that trades sperm, as research has shown that 27% of donors donate to more than one clinic.. This would require that the whole industry be accountable to one body. This is a call to those quoting that one-time estimate of 30,000, and to those concerned about the pitiful lack of oversight within the US sperm donor industry, to speak up about the lack of reliable information within the public domain. We need to demand that federal money be allocated to research, oversee and regulate this industry, and to do it in a thorough and comprehensive manner. In the meantime, everyone using these figures should acknowledge that they are 28 years out of date, and even then they were only rough guesstimates. Article on Percentages of Dairy Cattle Conceived of AI.